Take a break from the usual sightseeing and shopping and come Play In The Clay with a 3-4 hour introductory Pottery Wheel Class. You will loose yourself in the magic of working with clay. You will learn the basic techniques of working and throwing on the wheel with the assistance of an instructor. 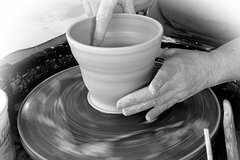 Each participant will create their very own wheel thrown pots with clay and may want to continue the craft with an instructor in your home town. Learn the steps needed to make functional pottery like mugs, bowls, and vases on the pottery wheel. This 3-4 hour session is a one on one workshop and is perfect for beginners. Maximum participants is two. During the first two and a half – 3 hours hours you sit at the wheel creating with the guidance of a teacher. In the last hour, hour and a half we will clean up our pieces, learn how to add handles for mugs and any other details necessary to finish your pieces. In a couple of weeks when they are completely dry they will be bisque fired and the second firing in the following week will be the glaze fire. Once they are complete they will be shipped to your front door. The entire process from start to finish can take 4-6 weeks to complete and ship to your location.